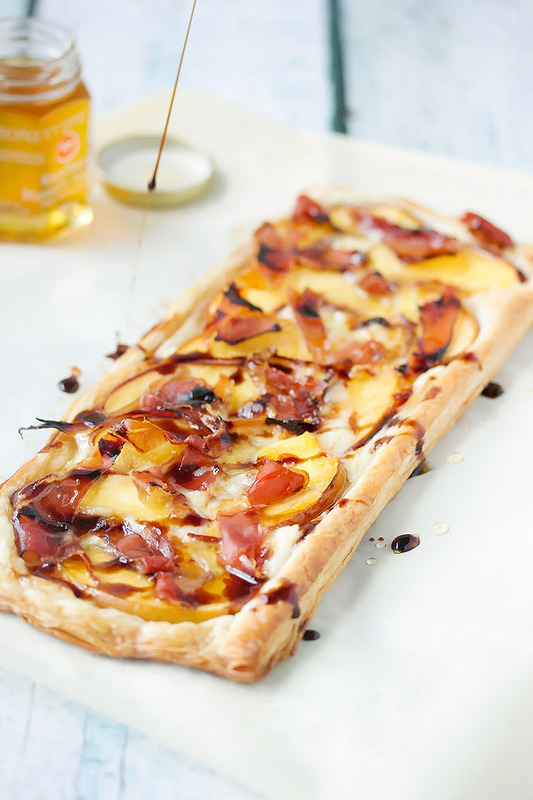 A sweet and savory puff pastry tart baked with peaches, brie and prosciutto then drizzled in honey and a syrupy balsamic reduction. Its simple and amazing. Sometimes the simplest things are just the best. 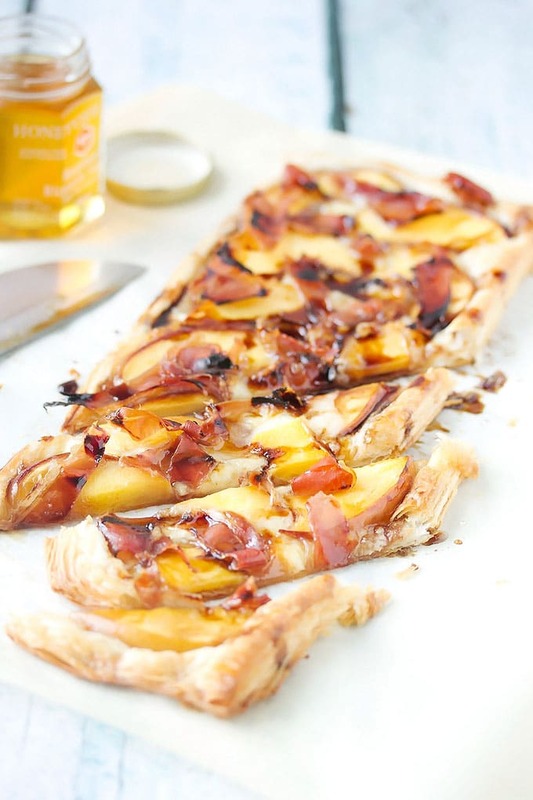 This peach, prosciutto and brie puff pastry tart is one of those wonderful things. Totally simple with only a few ingredients. Slightly cheesy with the perfect balance of sweet and salty and that fabulous crunch from the puff pastry. It takes only a few minutes to throw together, 12 minutes to bake and it will be gone in the blink of an eye. This brie tart will literally disappear 5 seconds after you put it down and whoever is lucky enough to get a piece will want more. So you had better make two. And invite us over. When Debbie and I first made this, we fell in love instantly. When I made this again later on that night when Kevin’s family came over for dinner, it was literally devoured in less than 5 mins. Apparently, Debbie and I are not the only ones who fell in love. The same kinda thing has happened every time this peach puff pastry tart has been placed on a table. I’m not kidding when I say you better make two! 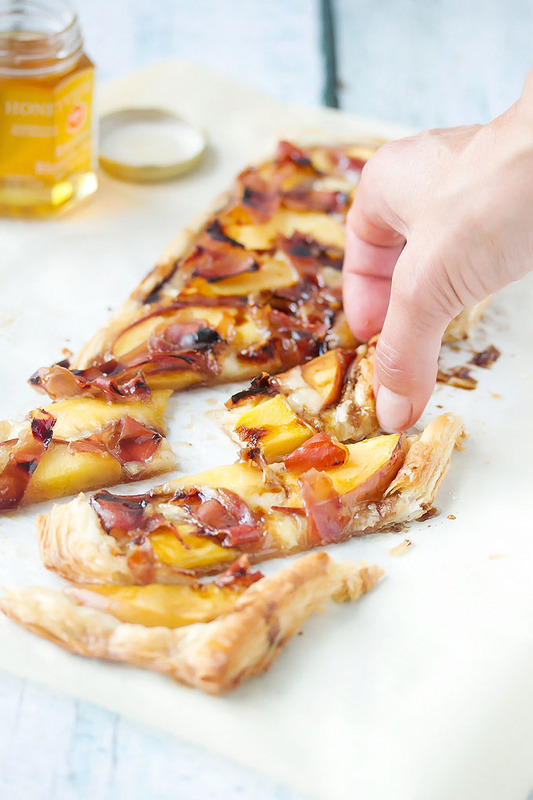 This brie and peach puff pastry tart is so dang easy to make. You don’t even have to peel the peaches. 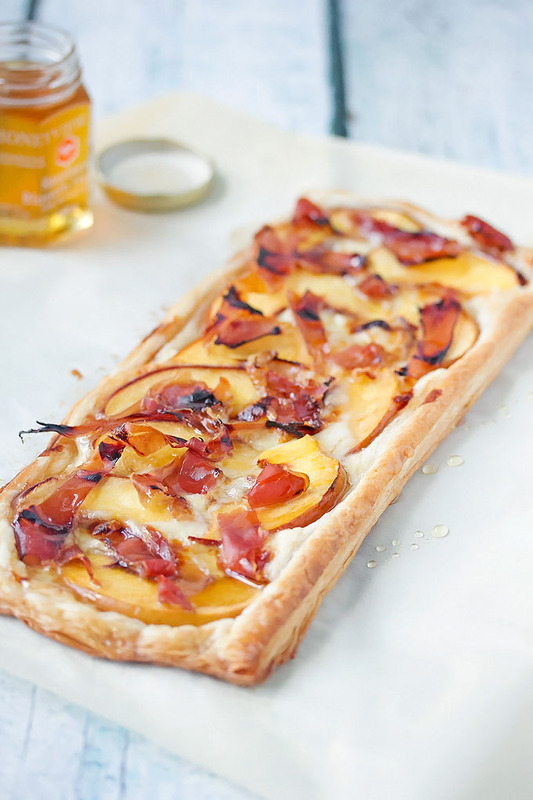 Just slice them up, drop a few pieces of brie on the puff pastry, top with the peach slices and then a torn up slice of prosciutto or two and drizzle with a little honey. We like to drizzle with a little more honey after the tart comes out of the oven along with a little balsamic reduction. A little tip: make sure your brie is cold when you slice it up. If you don’t it will be all gooey. You can even throw it in the freezer for 10 mins before you slice it. Silicone Baking Mats – these are so awesome and versatile! We often use parchment paper, but these work the same and are reusable. Parchment Paper – we like to have this on hand as well. Baking Trays – we love these heavy duty trays with the sides that come up a little. They come in handy for these tarts as well as anything else that goes in the oven. Cut the peaches in half, take out the pit and then cut into 1/4 inch slices. Set aside. Split the puff pastry in the box in half. Sprinkle a surface with a little flour and roll out the puff pastry into a rectangle approx 11 x 7 inches then take a sharp knife and cut the rectangle in half lengthwise. Pick up the pastry and place it on a parchment lined baking tray. Repeat with the second half of puff pastry. (trust me, you will want four of these). Using the knife, score the edges of the puff pastry about 1/2 an inch from the edge all the way around. Cut the round of brie in half and then cut off all the wax around the edges (unless you like to eat that part). Cut the cheese into 1/4 inch thick slices. First lay the brie on the tart evenly spaced. Don't cover the whole pastry, leave some room in between slices. Next lay the peach slices on the brie and follow with chunks of the prosciutto. Just tear the proscuitto slices up with you hands and place on the tart. Drizzle 1 tbsp the honey on top of each tart and throw it in the oven for 12 mins or until the edges are nice and puffed and browned. Remove the tart from the oven, drizzle with 1 more tbsp of honey and 1 tbsp of the balsamic reduction on each tart. Cut into pieces and serve right away. If you choose to make all 4 tarts, I would bake two at a time unless you are serving more than 8 people. 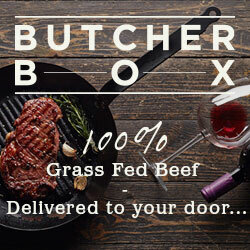 This sounds delish! What could be substituted for the proscuitto for vegetarians? Hmmmm… Hadn’t thought of that. Maybe you could try coconut bacon. Have you tried that? 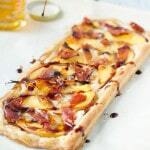 Its got that salty smoky taste to it and its pretty damn good on its own so I bet it would work on this tart. Do you end up with 2 tarts, or do you layer the puff pastry? This looks great! Just made this with thinly sliced pears and proscuitto this morning for a brunch, I hosted. Fabulous! However, I would recommend lining the cookie sheet with parchment paper before baking it. It makes clean up a breeze. Yummy. SO happy to hear you loved this. Its definitely one of our favorites, though I havent tried it with pears and Im sure it was equally amazing. We always use parchment paper as well and I have updated the recipe, thanks for reminding me. I tried this recipe and reviewed it on my website here: http://www.testingforthebestthing.com/prosciutto-brie-tart/ I made a few tweaks that you might wanna check out! Your version looked good too! Cantaloupe sounds like it would be pretty tasty! This was fantastic! I wish I would have made more, literally gone in 5 minutes! Everyone commented on how “fancy” it looked and I kept thinking how easy it was. Ha! Thats exactly what happens at my house lol. This looks so good! Do you you could use phyllo pastry? Ya you could sure try… Its going to be quite a bit crispier tho and it might fall apart. Let us know if you try it! Yes! It travels well. You can either serve it cooled or pop it in the oven to warm it up a tad before serving at your friends place. How could I use frozen peaches in place of the fresh peaches? I want to make it for Thanksgiving but fresh peaches in Hawaii are not good. I think you could… I would just thaw them and then try to take off as much moisture as you can so they don’t get the tart soggy. Let us know how it works out! I’m confused…after you roll to 11 X 7, cut it in half lengthwise, you end up with 2, 3.5 X 11 tarts?? You are using only half of the puff pastry in the package?? I can see how it might be confusing. We used all the puff pastry. Roll out one half in a big rectangle, cut that in half and then do the same with the other half of the puff pastry. Ive updated the recipe a bit so hopefully it will be more clear 🙂 The size of the tart doesn’t matter much either. Just roll it out! My puff pastry didn’t start to brown or puff until about 20 mins, any idea why? I left the Brie at room temp and diet was a mess to cut – di you slice yours cold? Hi Dawn, yes its best to cut brie cold. Im going to update the recipe to say so. Thanks for pointing that out. Also, its possible that your oven doesn’t get as hot as mine. Sometimes ovens vary in temperature. You could try upping the temperature slightly. Hope that helps! HI Barb, the recipe will make 4 tarts. How do you make the balsamic reduction? We bought ours and you can buy a balsamic reduction at most grocery stores. However, you can also make your own by simply bringing some balsamic vinegar to a simmer and reducing until its thicker and syrupy. Hi Karen, thats right! But just keep in mind that you don’t have to follow it exactly. If you like a little more prosciutto or cheese, or honey for that matter, just go ahead and throw it on 🙂 Hope you love it! Can this recipe be frozen and would I do it before or after baking? Thanks! I think you could! Freeze it before you bake it.